July 24, 2015 – A United Launch Alliance (ULA) Delta IV rocket successfully launched the seventh Wideband Global SATCOM (WGS) communications satellite for the U.S. Air Force at 8:07 p.m. EDT Thursday from Space Launch Complex-37. WGS-7 will join a constellation of satellites already on station, providing global coverage to the U.S. military and its allies. Boeing is the builder of the Wideband Global SATCOM fleet and ULA has launched all of the spacecraft to date. The satellites supply communications such as maps and data to soldiers on the battlefield, relay video from unmanned aerial reconnaissance drones, route voice calls and data messaging, and offer quality-of-life considerations like television broadcasts and email delivery to the troops. WGS is the only military satellite communications system that can support simultaneous X and Ka band communications. “This is the seventh installment of the WGS system. The satellites are an important element of a new, high-capacity comm system providing communications capability to our troops in the field,” said Ron Fortson, ULA’s director of mission management. With three more satellites in production, the WGS constellation is planned to have a total of ten satellites on orbit by 2018. 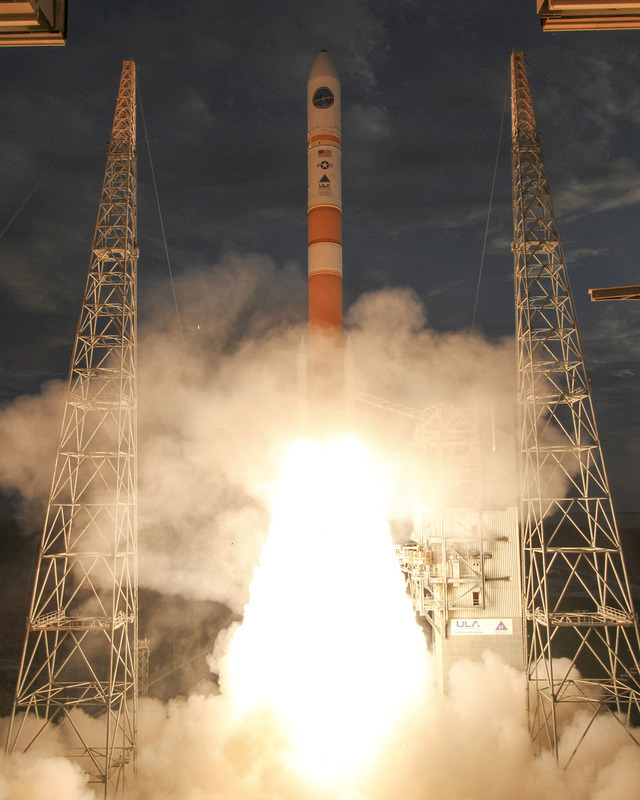 WGS-7 was launched aboard a Delta IV Medium-plus (5,4) configuration Evolved Expendable Launch Vehicle (EELV). The single ULA common booster core was powered by a newly uprated Aerojet Rocketdyne RS-68A main engine, along with four Orbital ATK GEM-60 solid rocket motors. The upper stage was powered by an Aerojet Rocketdyne RL 10B-2 engine with the satellite encapsulated in a five-meter-diameter composite payload fairing. The Aerojet Rocketdyne RS-68A is currently the world’s most powerful liquid-hydrogen/liquid-oxygen booster engine and provides 702,000 pounds of thrust at liftoff. This was the first Delta IV rocket to use this upgraded engine, which features increased thrust and improved combustion efficiency. The RS-68A will power all future Delta IV medium and Delta IV Heavy rockets for ULA. The RS-68A’s predecessor, the RS-68 engine, has been retired after 28 successful missions (42 engines total) with 100-percent mission success. This is ULA’s seventh launch in 2015 and the second successful ULA launch in only eight days. ULA’s next launch is the Atlas V MUOS-4 mission for the United States Navy, scheduled for August 31 from Space Launch Complex-41 from Cape Canaveral Air Force Station, Florida.